Narrative: went on a morning patrol. Had to walk in street as sidewalks covered with white frozen precipitation (aka snow). Only enemy sighted were 2 black dogs who launched approximately 15 medium range acoustic salvos (aka barks) in our direction. There fire was ineffective. We quickly determined they were quarantined in their boundary constraint structure (aka fence) and did not return fire and continued our patrol. We observed a yellow little hooman and would be juvenile delinquent personnel carrier (aka skool bus). Interestingly, bus stopped in front of a residence but no little hoomans came out. Yellow personnel carrier moved on with no pickup. I recommend that SWAT (scottie weapons and tactics) division send a team on a no knock insertion into the house to ascertain that no terrorists, hobos, joggers, bicyclists or huskies are holding that household hostage. We made it back to Base safety. Jpg of our patrol attached to this report. I certify this report is accurate. As we have come to expect, a well executed mission and concise report. Thank Dawg you are in charge with the faithful Ainsley! I am shaking my head in disbelief as to just how amazing you are Angus. You take care of every body even when the little yellow did not drive off with any new passengers!! Amazing sgt !! Dat looks like one cold patrol. 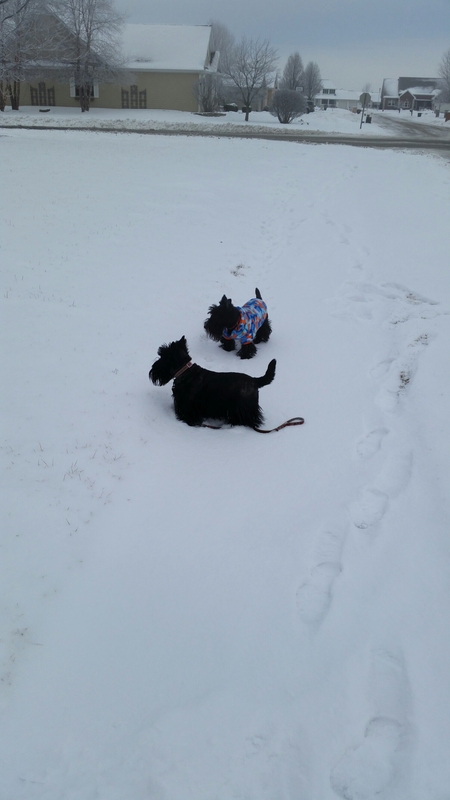 Well, one thing about a black Scottie, they will never be lost in a snow storm!…….now maybe a wheaten of a westie. East of Angus sector, SW PA Fergus/Guinness sector: Hoomans left us alone today so no outside patrol. Inside acoustic salvos for blue/white Am. flag truck and bundled dressed mail carrier who dared navigate the snow/ice covered walk. Must have frightened said person as a pkg was dropped on front entrance and left up for grabs. Earned naps finished the event. Pvt. Benjamin here, Sir. (Hmmm…that sounds vaguely familiar.) Anyway, reporting in from the Northeast Angus Sector, New England Division, state of New Hampshire, City of Portsmouth/Ben sector. Outside patrol uneventful except for continuing surveillance on nearby structure containing Yellow Lab. Launched acoustic salvos at said structure as warning for occupant detainees to remain inside. Sustained injury on front right paw due to frozen ground precipitation and had to be air lifted by human back to base. I received warm towel massage and resumed my station on couch in front of fireplace to recover. Be careful Ben – I’ve had quite a few run ins in my day with Labs. A lot of inexperienced soldiers confuse them with Goldens – but Labs pack quite a lot more attitude.